Rustic and wintery, cushions make homes feel warmer and cozier. Is there a quicker, cheaper way to personalize a space? 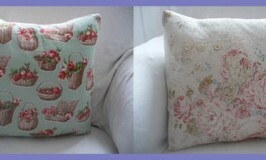 Vintage cushions can be handmade, from any vintage fabric you can find, or any scrap you have lying around at home. You could even make your own vintage scarf cushions out of some antique silk scarves.